In order to acquire sales-ready leads, you must first learn how to properly identify and assess both user interest and the best sales prospects. So, how can this be accomplished? Generating reports allows you identify trends, prospect stage, and sales-ready leads. These reports are commonly generated from the data derived via event tracking, or the measure of how users interact with the content on your website. When you implement event analytics, you’re able to gain a clear view of your prospective leads and where they stand. For example, your viewer could be two-thirds to 90 percent of the way through their decision process (Forrester) before even viewing your webinar, so it’s necessary that you’re able to gage this type of information in order to effectively service your audience. Once you’ve found a successful method for proving your ROI, you’ll better understand how to increase revenue. Real-time graphical dashboards and drill down tools have proven effective in assessing ROI in terms of its current status and the areas that could be improved upon. It’s beneficial to have access to summary dashboards and specific reports – updated in real-time – that detail widget activity, registration conversion, content viewed, survey responses, and questions submitted. This information ultimately determines exactly how you can improve your ROI. If you’re collecting metrics in any campaign that you define, such as user profile, lead sources, viewer activity, and engagement scores, your lead-scoring and nurturing process can be leveraged. According to Forrester, companies that excel in lead nurturing generate 50% more sales-ready leads at a 33% lower cost. These campaign analytics can take you to the next level because, when you’re able to see what viewers are responding well to, you can then incorporate that type of material into your content. This is crucial especially because, according to a study conducted by The Content Marketing Institute, generating content and audience development are the biggest challenges. It is crucial that you compare your performances to averages across a selected target segment, such as technology, legal services, or accounting. Also, you should be comparing your performance to the “best-in-class” events of your peers so that you’re able to identify achievable goals for improving viewer engagement and enhance your performance and ROI. This kind of benchmarking is helpful because it allows you to remain informed about what your competitors are doing and what you could do better. Continuous analysis and improvement is a fundamental tactic for leading companies that deliver exceptional events to their esteemed viewers. This checklist will help your business lead with a newfound stride. 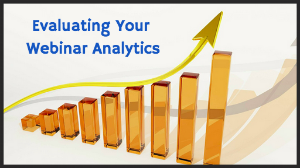 Now that you know how to evaluate your analytics, learn how to increase them!